This entry was posted on October 9, 2017 by Greg Forrer. Arnott's new adjustable Ultimate Ride Mono Shock Air Suspension Kits for the Kawasaki® Ninja® ZX-14™ have been custom-designed to replace the original shock and provide the rider superior control, ride comfort and height adjustability. The FOX® shock's custom tuning is designed to provide a safe, responsive and comfortable ride. Arnott's patents-pending kit offers TruAIR™ Technology with a rugged air spring bladder and shock damper design, not an air cylinder or air-assisted unit. This gives the rider more control and flexibility over air pressure, ride comfort and height adjustment. 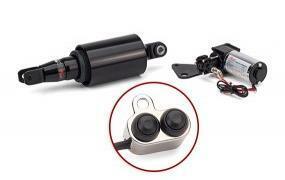 At the core of this system is a custom, nitrogen-charged FOX shock absorber. Then, using a patent-pending design, Arnott adds a rugged Goodyear air spring, ensuring superior comfort, ride quality, and durability. Arnott pairs the shock with a small but powerful compressor, application-specific mounting bracket, and air distribution valve block which includes a muffler to control how fast air is released. -- 2006 to 2017 Ultimate Ride Black Handlebar Inflation Switch (MC-2976) -- Retails for $1,099. Minimum Length: 10.36 inches; Maximum Length: 12.52 Inches. -- 2006 to 2017 Ultimate Ride Chrome Handlebar Inflation Switch (MC-2977) -- Retails for $1,099. Minimum Length: 10.36 inches; Maximum Length: 12.52 Inches.